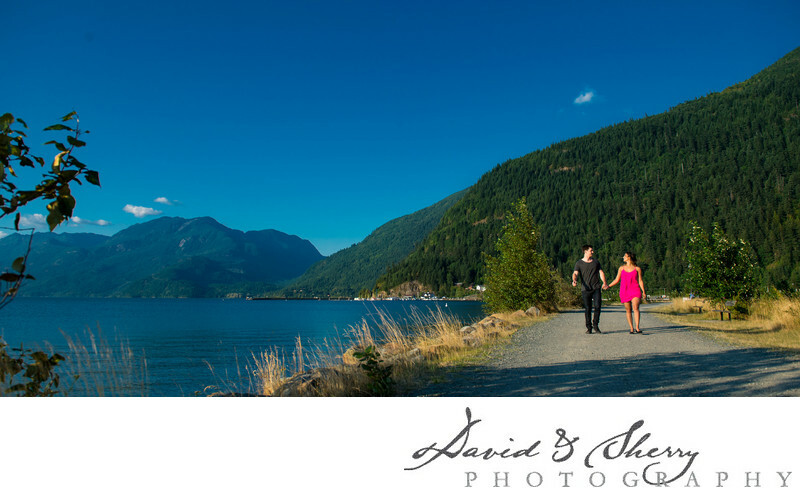 If you're looking to have beautiful and natural photos of your wedding, engagement or pre-wedding and don't want to go too far from Vancouver, you'll want to go into the Fraser Valley to Harrison Hot Springs Lake. With a view of mt cheam, a fresh water lake, a luxury hotel and a quaint little town, this village offers a unique feel for weddings. Dallas & Meray joined us for an epic Couplescape shoot which covered many different locations. One of those was the beach where he famous sand sculptures are held each year. Here we focused on the beautiful light which was filtering down on the sunny summer day to accent these two against the mountain backdrop of the B.C. Rockies. The area is surrounded by views of nature, natural vistas, and happy people who attend to take their boats out for the day. It is also a wonderful place to take vacation photos with your family. It's places like these that make British Columbia such a popular destination for those who want to get away from the big city and stretch out their legs and feel space around them. We love photographing in the summer time at Harrison Hot Springs. It is clear, crisp, beautiful and there are full views of nature without anyone else in the view. Brides and grooms love it especially when they use the photos for their save the date cards or invitations. Location: Harrison Hot Springs, B.C..